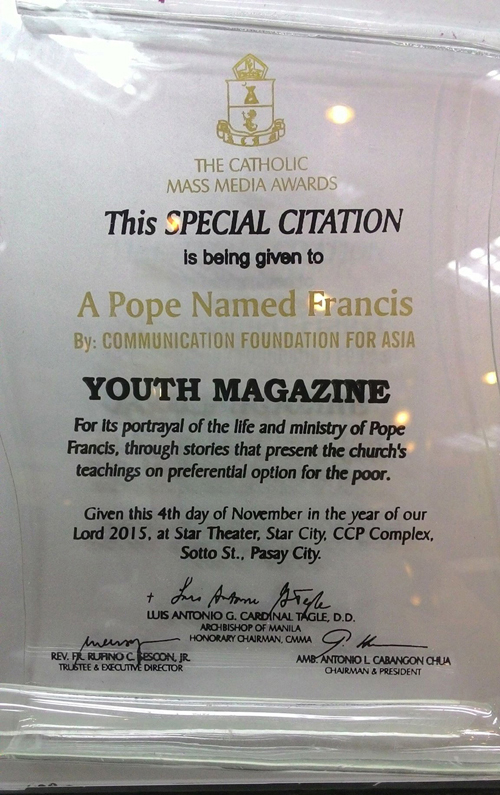 CFA’s special edition, “A Pope Named Francis,” won a Special Citation in the 37th Catholic Mass Media Awards held Nov. 4 at the Star Theater. The comics magazine presents Pope Francis as a model of the Church’s teachings on preferential option for the poor. “A Pope Named Francis” is still available in English and Filipino versions at the Communication Foundation for Asia, St. Paul’s and Paulines bookstores. In addition, CMMA also recognized CFA’s participation in the Special Documentary Team that covered the Papal visit in January. ON THE NIGHT of the Catholic Mass Media Awards rites in UST on October 13, guests were puzzled when the same people from one small group repeatedly went upstage to claim their awards. The recipients belonged to a non-mainstream media organization called the Communication Foundation for Asia. CFA’s haul that evening: six trophies. It went home with two trophies for Hall-of-Fame induction: Gospel Komiks, three-time winner for Best Children’s Magazine, and www.cfamedia.org, the Best Website winner for three consecutive years from 2007-2009. CFA also bagged this year’s trophies for Best Children’s Magazine (Baby Jesus), Best Youth Magazine (Gospel K Magazine) and Best Comics Story (Noel de Leon’s “My Favorite Christmas,” published in Pambata). 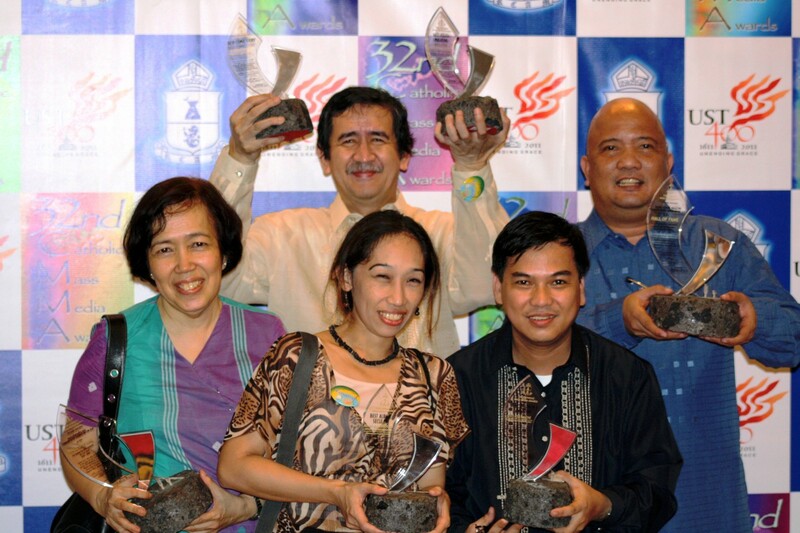 The last trophy, for Best Secular Music Album, went to “Mga Awit ng Mga Bagong Bida,” which is a unique collection of the ten best songs composed by students for the National Youth Songwriting Contest for Good Governance, a major CFA project in late 2009. It has neither printing press nor radio/TV broadcast facilities that the industry giants do. And yet for over the past 40 years, CFA has published various educational magazines and books, produced two full-length developmental movies (“Batingaw” and “Sugat sa Ugat”), several radio drama and TV series for values education and documentary videos. Founded in 1968 by a Dutch MSC priest, CFA’s origins go way back to 1960 when its parent organization launched the publication of the Philippine edition of the Catholic Digest. Nowadays, in lieu of commercial broadcasting, CFA makes use of social networking outlets like YouTube, Livestream and Facebook. And year after year, with grants from various donors, this devcom pioneer, which is based in a brick building in Sta. Mesa, trains hundreds of Church and civil society members in the use of media for their missions and advocacies. It’s hard to argue with six CMMA trophies on a single outing.